After the great success of Cookie Clickers, we introduce you Sushi Clickers! 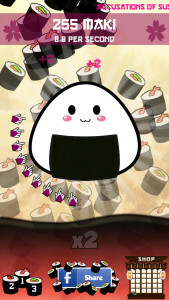 Are you a fan of the clicker game, but your favorite food is Sushi? This is your game! The game is very simple and everybody can play: tap on a giant Onigiri as fast as you can and make as many Maki Sushi’s as possible. When you have enough Maki’s, visit the shop and use the Maki’s to buy upgrades and make even more Maki Sushi. Sushi Clickers is an endless game you can play as long as you want! Invite your friends on Facebook, challenge them and become the Sushi Clickers Master!